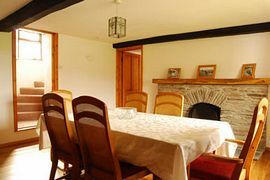 Yarde Farm is spacious, comfortable 17th Century farmhouse set in 6 acres. Dating back to the Doomsday Book, it has been carefully renovated to create quality holiday accommodation. Yarde Farm, which sleeps six (plus travel cot), is set on the stunning North Devon Coast in a picturesque valley just outside Mortehoe near Woolacombe. Some of the features include a unique turret staircase,a walled courtyard garden, open fires and stone flagged floors. The accommodation consists of 4 bedrooms, each with TV. A modern, porcelain tiled bathroom with shower over bath. 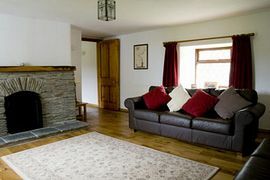 Downstairs is a large fully equipped farmhouse kitchen, spacious dining room with open fire, a comfortable living room also with open fire Freeview TV, DVD & Stereo. There is also a large Wet room with WC, shower & basin and a separate utility room with full laundry facilities.Free Wi-Fi is available for guests. Outside there is ample parking and a large, private enclosed child friendly rear garden.A selection of toys and outside games are provided. Yarde Farm is owned and managed by Roger and Kate, who will personally welcome you on arrival and ensure you have everything you need for an enjoyable stay. 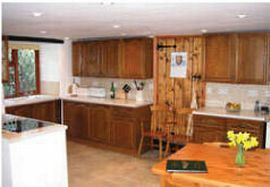 Yarde Farm is exceptionally large and spacious. Yarde Farm is a wonderful location. Bed & kitchen linen & towels. To reach Yarde Farm, leave the M5 at junction 27, and take the A361 sign posted Barnstaple. On the approach to Barnstaple follow signs for A361 Ilfracombe (left at mini roundabout) at the second roundabout follow the A361 to Braunton/Ilfracombe and cross the long bridge. After approx 5 miles at the traffic lights in Braunton village centre follow the signs for A361 Woolacombe. At large roundabout (Mullacott Cross) take first exit. At a fork in the road turn right signposted Mortehoe. Continue down the road and after passing Damage Barton Caravan Site, the entrance to Yarde is about 200 yards on the right. See map. Full tariff details can be found on our website. "The best base for a family holiday we've ever found. Its such a pleasure to find the place was just as lovely as advertised. Roger & Kate are lovely hosts and the"ir attention to detail is brilliant.All the little touches add to it feeling like a home from home" "Totally awesome place to stay, lovely and clean, very comfy beds" "We have loved our two week stay at Yarde. The accommodation is great, warm, comfortable, well equipped and very pracical for families with small children. The wet room is brilliant!" "What a wonderful holiday for us all. 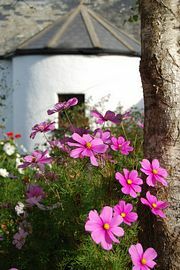 We absolutely love Mortehoe, but to have found Yarde - well what a bonus - so very beautiful in every way." "Yarde Farm is simply Idyllic."